ICA press releases are hilarious! And that’s just a sampling of the goodness that’s on offer. There’s more what that came from – check out the press releases for the year (and have a look through the archives while you’re at it)! I totally want to meet the person(s) behind this, man. I think we’d become good friends. Ministry of Foreign Affairs eRegister system. If you’re a Singaporean, and you’re going overseas for work or travel, it’s probably best if you register your details with the Ministry of Foreign Affairs (MFA). I don’t know how much information is used for ‘surveillance’, but I think it’s always good to be prepared in the event of any emergencies. BTW I found out about this thingy after submitting an Overseas Travel Notification to the Ministry of Defence – not because I want to, but because it must be done. Anyways, there was a nifty little link provided at the end of the confirmation page which brought me to the MFA eRegister system, and I thought I’d share it with everyone because I think all of you should know about this. Also, since the Civil Service often gets more brickbats than it does bouquets, I thought I’d take some time to express my pleasure at a good idea (IMHO) and a good example of synergy at work. 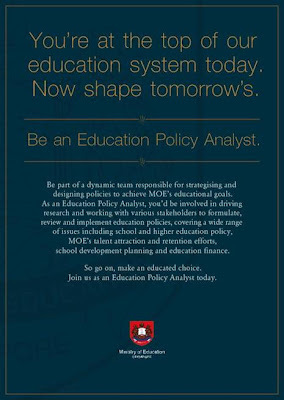 This is an exclusive preview to MOE’s recruitment of Education Policy Analysts to selected NUS Alumni. For more information and application of this position, please visit the Ministry of Education website at http://www.moe.gov.sg/careers/eas/. The closing date for applications is on 28 Feb 2009. Truth be told, I’m actually quite interested in this offer, especially being where I am at this point in my life. I’m going to e-mail them to ask how it’s gonna work out for someone in my position. One of the turn-offs so far is that the entry requirement don’t require you to possess a professional qualification in the area of education, or to have taught before in an educational institution. I find this rather strange, as I am basing this on the assumption that one needs to have some knowledge of educational pedagogy and educational reality in order to “shape the education landscape of tomorrow”, but it seems I might be wrong. As processing will be based on the application form, it will not be necessary for you to attach a separate resume. We regret that incomplete application forms will not be considered and only shortlisted applicants will be notified. I’m shure this is a standard civil service policy, to reduce duplication of effort, red-tape, etc. But doesn’t it immediately disqualify people who aren’t able to fit their experiences into the requirements of the template provided in the application form? Or is that the point itself: that there is already a mould in which applicants must fit into? If this is the case, the civil service is always going to end up with cookie-cutter versions of policy makers – something which I don’t know if it wants to achieve, given that diversity management is an important consideration in organisations today.